This green-certified hotel manages to be both hip and welcoming, inviting guests to lounge in the lobby on soft couches, enjoy the garden and jogging track, and even to bring Fido. BART, the Chinatown Gate, Union Square, and the high-end Crocker Galleria shopping complex are nearby. 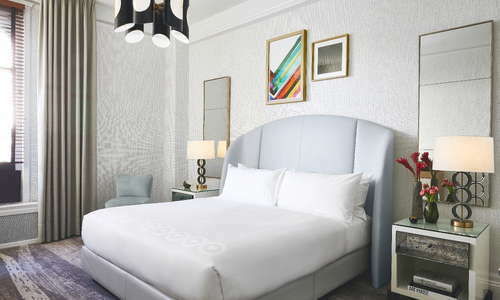 YOU SHOULD KNOW Weekends are your best bet for getting discounted rates, though, if you're looking for action, the Financial District feels pretty lonesome on Saturday nights. 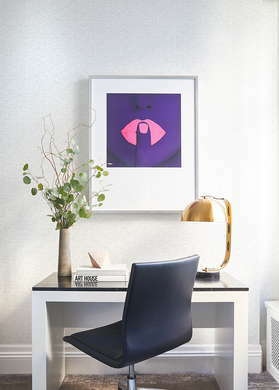 While rooms are small, they offer all the typical technological amenities and a hip aesthetic. Interiors offer a playful vibe with local art, plush bedding, and coffee table books to breeze through. Small bathrooms feature grey mosaic tiles, textured ebony wood, and a walk-in glass door shower. Managing to be both comfortable and classy, the lobby's after wine hour, served in front of the pièce de résistance, a massive, hand-sculpted art-nouveau fireplace that looks like it leaped out of a fairy tale, offers a respite from the outdoors. Original 1911 skylights and artwork by local artists contribute to the inviting atmosphere. The hotel's jogging track and small fitness center please those needing an exercise fix. Gaspar, a French brasserie, serves duck confit, steak frites, and escargot in an intimate environment. The dining room is dark with guests sitting atop maroon banquettes. Complimentary morning coffee and tea and evening wine are served in the lobby. Gaspar's fine wine list lures guests to stay long after dinner ends. Valet parking tops $50 a night. 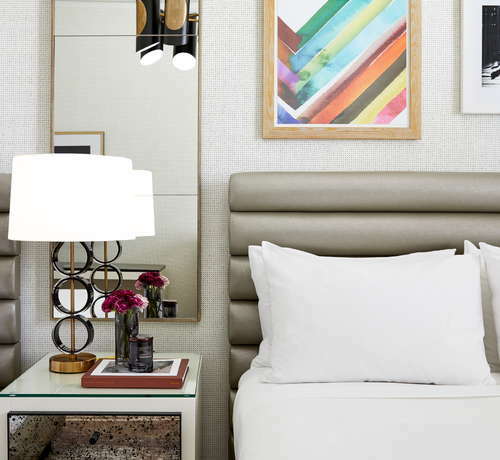 Opt instead to take advantage of the hotel's proximity to attractions and neighborhoods like Union Square, North Beach, Nob Hill, Chinatown, SoMa, and more. Muni buses and trains, BART trains and the cable car are all within a short walk. Score a reservation well in advance for a table at Michael Mina's flagship restaurant (11-minute walk) to enjoy his lobster pot pie and other fanciful dishes of the moment. Fans of dim sum will adore the lively Yank Sing (7-minute walk) for the array of dumplings and traditional Chinese brunch fare. Ginger's (5-minute walk) is the city's newest LGBTQ bar, slinging classic cocktails in a laid-back setting. For a lively scene complete with craft cocktails and live music, head over to the Rickhouse (1-minute walk). Style, affordability, and a fab location in the heart of the Financial District make this pet-friendly spot (there's no fee) a hidden gem.